Well, today we are going to set the record straight with your elevation frustration. 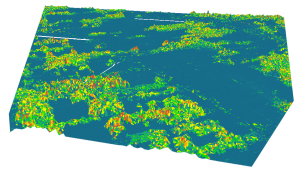 Let’s explore the differences between these three types of GIS elevation models. In a LiDAR system, pulses of light travel to the ground. When the pulse of light bounces off its target and returns to the sensor, it gives the range (a variable distance) to the Earth. Hence, how this system earned its name of Light Detection and Ranging. In the end, LiDAR delivers a massive point cloud filled of varying elevation values. 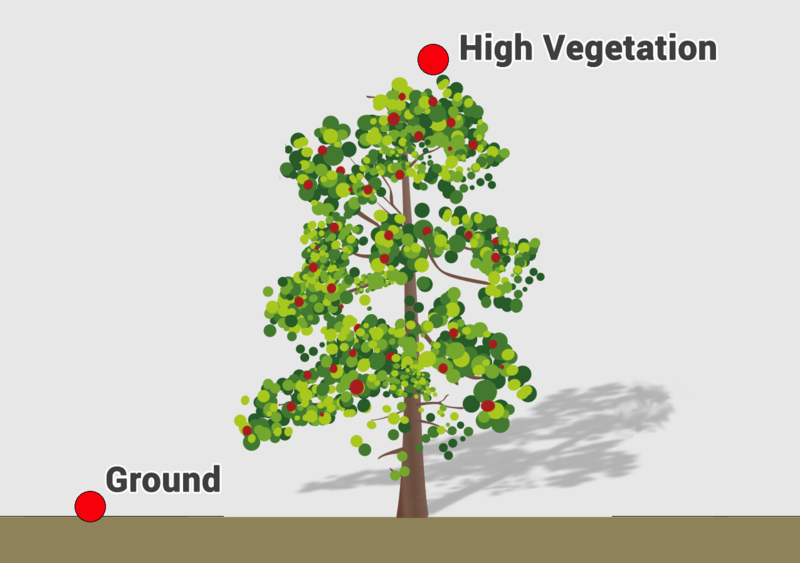 But height can come from the top of buildings, tree canopy, powerlines and other features. A DSM captures the natural and built features on the Earth’s surface. RUNWAY APPROACH ZONE ENCROACHMENT: In aviation, DSMs can determine runway obstructions in the approach zone. VEGETATION MANAGEMENT: Along a transmission line, DSMs can see where and how much vegetation is encroaching. VIEW OBSTRUCTION: Urban planners use DSM to check how a proposed building would affect the viewshed of residents and businesses. A digital elevation model is a bare-earth raster grid referenced to a vertical datum. When you filter out non-ground points such as bridges and roads, you get a smooth digital elevation model. The built (power lines, buildings and towers) and natural (trees and other types of vegetation) aren’t included in a DEM. HYDROLOGIC MODELLING: Hydrologists use DEMs to delineate watersheds, calculate flow accumulation and flow direction. TERRAIN STABILITY: Areas prone to avalanches are high slope areas with sparse vegetation. This is useful when planning a highway or residential subdivision. SOIL MAPPING: DEMs assist in mapping soils which is a function of elevation (as well as geology, time and climate). When you refer to the USGS LiDAR Base Specification (on page 28), a digital terrain model (DTM) actually has two definitions depending on where you live. DTMs are typically created through stereo photogrammetry like in the example above. For example, contour lines are in purple. The DTM points are regularly-spaced and characterize the shape of the bare-earth terrain. 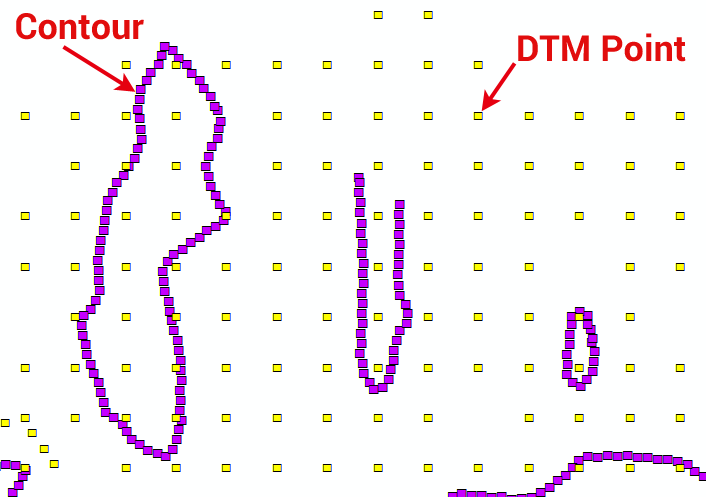 In the image above, you can see how the DTM is not continuous and that it’s not a surface model. From these regularly-space and contour lines, you can interpolate a DTM into a DEM. 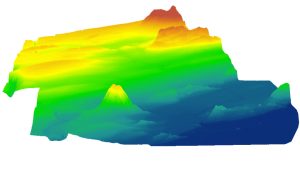 A DTM represents distinctive terrain features much better because of its 3D breaklines and regularly spaced 3D mass points. How to capture Digital Elevation Models? SATELLITE INTERFEROMETRY: Synthetic aperture radar such as Shuttle Radar Topography Mission uses two radar images from antennas captured at the same time to create a DEM. PHOTOGRAMMETRY: In aerial photography, photogrammetry uses photographs from at least two different vantage points. Similar to how your vision works, it’s able to obtain depth and perspective because of the separate vantage points. LiDAR: Using light, LiDAR measures reflected light that bounces off the ground and back to the sensor to obtain elevation of the Earth’s surface. (trees and other types of vegetation) aren’t extruding in a DEM. (trees and other types of vegetation) aren’t INCLUDED in a DEM. Where do TIN’s fit in with this? Can we use DSM for mapping informal settlements?